So says Peter Schiff, CEO and Chief Global Strategist of Euro Pacific Capital in edited excerpts from an interview* he had recently with Taki Tsaklanos (goldsilverworlds.com) entitled Peter Schiff: The Collapse Of The Dollar Is Unavoidable. When the dollar became the world reserve currency in 1944 the U.S. was a fundamentally different country than it is today. At that time, the dollar was backed by gold. Everyone holding dollars could exchange it for gold at a pre-set rate. Gold was available on demand, so the dollar was as good as gold. In that period of time, the U.S. was the world’s biggest creditor nation. It had a huge trade surplus which it invested in the rest of the world. The fact that the U.S. once was so great, however, does not mean it still is. None of the attributes that made…it deserving of the world’s reserve currency exist today. Schiff’s fundamental concerns are related to politicians who are not doing the right thing. What will the dollar be replaced with once it falls? the price of everything else goes down. 5. 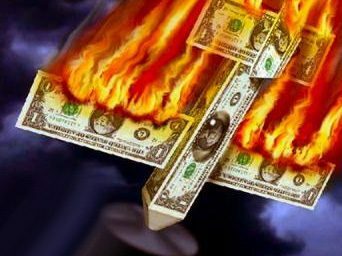 Shift From U.S. Dollar As World Reserve Currency Underway – What Will This Mean for America? 6. Now Available: Debit Cards Backed By Actual Gold & Silver! Precious metals have historically been excellent ways to preserve one’s purchasing power over the long term. However, in today’s world, they do not act well as a medium of exchange. To solve this problem Peter Schiff and his teams worldwide have worked out a totally new service: the first Gold and Silver Debit cards that gives bank customers access to their gold and silver holdings.